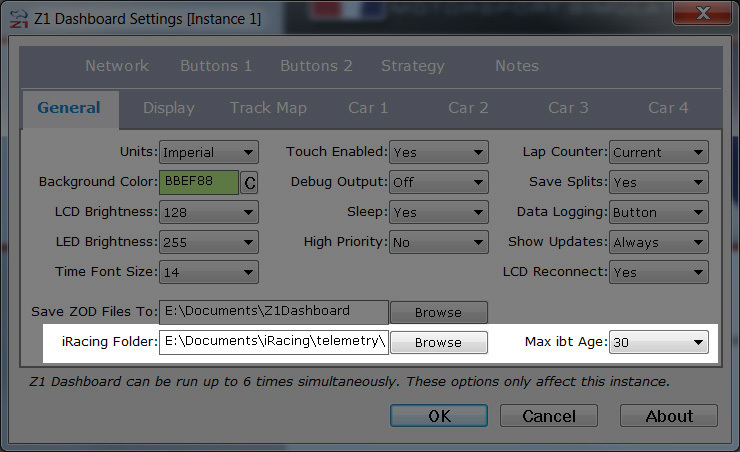 The Z1 Dashboard software incorporates easy telemetry analysis for iRacing ibt telemetry files. (Note that this is not the same as the Telemetry Dashboard.) The analysis is not intended to replace a sophisticated system such as Atlas, but rather to provide a quick way to view, in real-time, the basics. The analysis of the telemetry incorporates two screens: the telemetry selection screen, and the telemetry analysis screen. This page discusses the selection screen. Watch the YouTube video on telemetry screen in action. The first time you use the software, you must set the correct folder path within the Settings Dialog in order for the software to find your telemetry folder. Open the Settings Dialog by clicking on the settings icon and select the General tab. Click on the Browse button near the bottom of the dialog in order to open a file chooser. You may then navigate to the folder using this file chooser to select the appropriate folder. Note that if the Z1 software displays the message "folder not found" in the Select Telemetry Lap screen, then the path specified general settings tab is incorrect. In order to view the telemetry analysis you must first have a lap recorded from within iRacing. To do this you would turn on telemetry recording within the sim. By default this is done by pressing the Alt-T combination. Then go and drive one or more full laps. When you are done press the Alt-T combination again to finish recording. The laps you drove will now be available for analysis within the screen software. There are a few additional parameters that determine which laps will be displayed for selection. First, the laps must be done in the currently loaded car and at the currently loaded track. Second, the laps must have been recorded within the number of days specified by the Telemetry Days drop down in the Settings Dialog. The default is 30 days. Once you have set up the parameters, as described above, you are ready to select your lap. The top line of the selection screen allows you to scroll through all the available laps by pressing either the right or the left arrows. 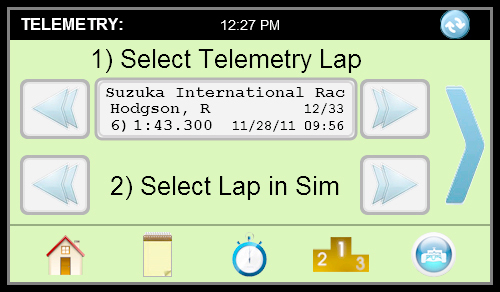 The driver of the lap, along with the lap number, lap time, and date and time recorded will be displayed. The software does not continually scan for laps. So if you record a new lap after starting the software then you will need to press the refresh icon at the top right of the screen to have that new lap displayed for selection. Note that the lap times are calculated by subtracting the time of the first frame of the lap from that of the last frame. Therefore the lap times might be slightly off from what the sim reports. This is normal and will not affect the display of the telemetry. The second line of the screen allows you to sync up iRacing to the same lap that you have selected. Pressing the right or left arrows will move the replay forward or backwards one lap, placing the car at the start/finish line. You will need to make sure you are using the desired camera to view your car from within iRacing. You do not need to have a replay to view the telemetry, it just makes it a better tool if you do. Once ready to view the telemetry press the large arrow on the right side of the screen.